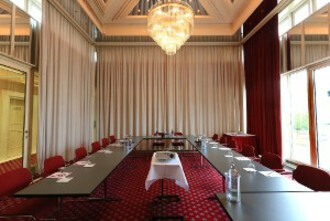 Two exclusive meeting rooms (capacity of 30/60 persons), Salon Belvedere (standing room capacity of 60 persons possible) connected to Restaurant Weinrot and an inner courtyard are available for your meetings in Berlin. 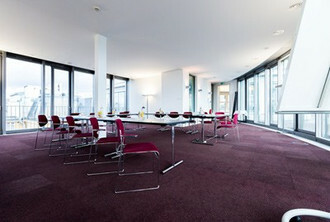 In addition to the established meeting rooms, the recently openend Convention Center offers two modern, light-flooded, meeting rooms with 57sqm and 101sqm including an all round terrace with a view over Berlin. The Foyer of the Convention Center is the perfect location for coffee breaks and can also be used as a lounge or breakout room. Our Meetings Brochure provides a detailed overview of our rates, technology, rooms and other services (tables/menus, flowers, decorations, musicians etc.) as well as an itemized food and beverages price list that can be charged on a consumption basis. Please refer to our itemized price list for additional technology listed under Technology for Meetings. If desired, we can also provide you with custom rates for meetings or food and beverages. High tables, conference chairs and banquet tables are included in the meeting flat rate or room rent, additional equipment, special chairs and other accessories can be reserved by special request. *The quoted prices for technology exclude a fee of € 30.00 for delivery and pick-up plus VAT. We reserve the right to modify prices. Our Meetings Brochure (PDF) contains a detailed overview of our rates, technology, rooms and other services (tables/menus, flowers, decorations, musicians etc.). 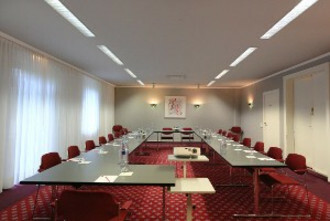 Please refer to our meeting packages that include use of standard technology, tables and chairs. Our Salon Bellevue is situated on the 6th floor of Hotel Savoy directly beneath the skies of Berlin. Natural light illuminates the room from the glass ceiling and the front most windows provide access to the rooftop terrace. The brightness of the room with a 5.50 m (18 ft) ceilings and area of 56 sq m (600 sq ft) contribute to a feeling of spaciousness. 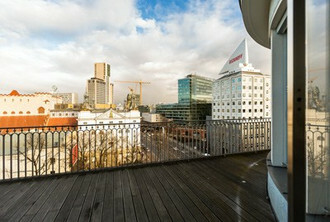 Meeting attendees or guests at a private party have an outstanding view of Berlin from the terrace. 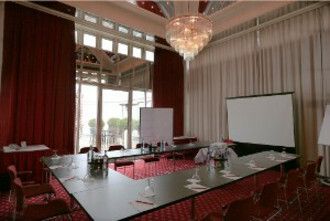 Salon Bellevue is equipped with dimmable lighting, an air-conditioning system and telephone/fax connectivity. The standard technology included in the room rent or meeting flat rate includes a beamer, projector screen, flip chart and pin board. Please refer to our meeting packages that include use of standard technology, table and chairs as well as an itemized price list for additional technology under Technology for Meetings. Our Meetings Brochure (PDF) contains a detailed overview of our rates, technology, rooms and other services (tables/menus, flowers, decorations, musicians etc.). The bright garden salon offers space for up to 60 persons and its window façade provides access to the green inner courtyard. The broad view of the courtyard creates a friendly, open atmosphere. Situated on the mezzanine floor and removed from hotel activities, this 63 sq m (680 sq ft) room with 2.75 m high ceilings is fully air-conditioned with dimmable lighting and telephone/fax connectivity. 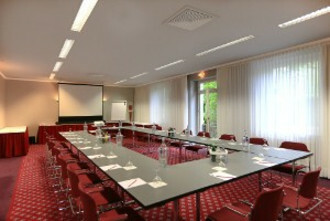 The standard technology included in the room rent or meeting packages includes beamers, projector screen, flip chart and pin board. In summer, meeting participants can also relax in the green courtyard. The green courtyard can also be used for coffee breaks, initial greetings or the final get-together of your event. 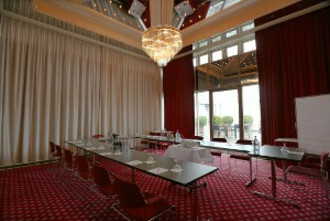 Connected to Restaurant Weinrot, Salon Belvedere is 85 q m (915 sq ft) and provides access to the courtyard. With space for up to 60 persons, it is perfect for standing receptions and gatherings. 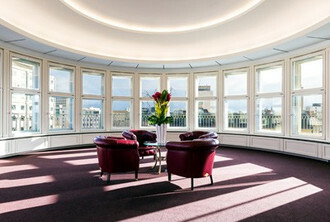 Ever since its inauguration on 21 September 1998, the building affectionately referred to as the “armadillo” has become yet another attraction for Fasanenstraße. Conceived as a symbol for the performance, creativity and progressiveness of Berlin’s economy, the Ludwig Erhard Haus is a meeting place for regional companies and businesses. The modern, flexible communication and service center contains a subdividable conference room with a capacity of up to 450 persons. Our partnership allows us to quickly rent rooms for larger events without complications. With its central location, the Ku’ Damm 101 Design-Hotel is the ideal meeting spot for business travelers. 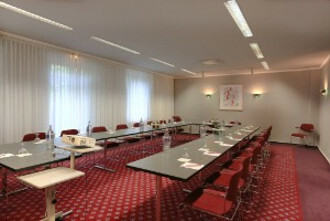 Workshops, Meetings and other events are held in the representative conference rooms and suites with capacities of up to 120 persons. An excellent range of technology is available: Presentations, video conferences and intranet LAN data transfer with up to 1 GBit/s or intranet WLAN with up to 54 MBit/s in addition to Internet connectivity with up to 34 MBit/s are all available. The competent event team has much experience in designing and fulfilling requests for outstanding events, cocktail parties and private gatherings.